Below is an interesting excerpt about people’s perceptions towards Christians in general. Comments are welcome to verify the accuracy on some of these perceptions. In 2007, David Kinnaman published his groundbreaking book, UnChristian: What A New Generation Really Thinks about Christianity. This book is the result of three years of extensive interviews with young adults today. Through his research, Kinnaman discovered the negative perceptions the unchurched (he called them “outsiders”) had toward Christianity, which altered their willingness to commit their lives to Jesus. (1) Hypocritical: Outsiders consider us hypocritical—saying one thing and doing another—and they are skeptical of our morally superior attitudes. Christians present the church as a place only for the virtuous and morally pure people. (2) Too focused on getting converts: Outsiders wonder if we genuinely care about them. They feel like targets rather than people. They question our motives when we try to help them “get saved,” despite the fact that many of them have already “tried” Jesus and experienced church before. 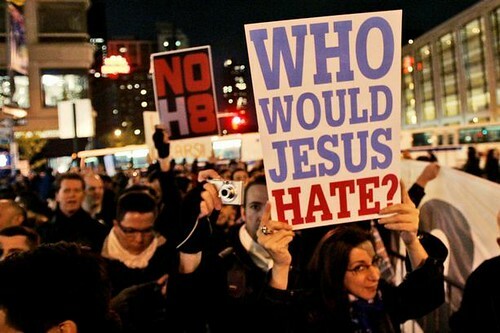 (3) Anti-homosexual: Outsiders say that Christians are bigoted and show disdain for gays and lesbians. They say that Christians are fixed on curing homosexuals and on leveraging political solutions against them. (4) Sheltered: Christians are thought of as old-fashioned, boring, and out of touch with reality. Outsiders say we do not respond to reality in appropriately complex ways, preferring simplistic solutions and answers. We are not willing to deal with the grit and grime of people’s lives. (5) Too political: Another common perception of Christians is that we are overly motivated by a political agenda, and that we promote and represent politically conservative interests and issues. Conservative Christians are often thought of as right-wingers. (6) Judgmental: Outsiders think of Christians as quick to judge others. They say we are not honest about our attitudes and perspectives about other people. They doubt that we really love people as we say we do. 1)Hypocritcal, from what I know is that one who do not practice what they say. Remember the story of the Good Samaritan. The Priest and Levite are the examples of Hypocrites, while the good samaritan lead by action. Faith without action is as good as dead. 2) Too focused on getting converts, I think people must changed themselves before change others. One must be the light of world, so the people of the darkness will attract to them. Even the turtle of sea follow the light to return to the sea, why not man? 3) Anti-homosexual, I think it was derived from the case of Lot in Sodom. People must the hurt from those people in order to help. Hurt people hurts others. 4) Sheltered, there are some misunderstand from people who don’t understand the Bible. If true christian are old fashion, than why renew your mind. Renew your mind, mean change your perception in things. Changing is all about creativity, creativity is not old fashion so do christianity. As people grow in their walk, the more creativity they are. The problem is people stop walking the walk, doing the talk. 5) Too political, what I feel is return what belong to God to God, what to belong Caesar (government) to Caesar (government). 6) Judgmental, Do not condemn others people! You will be judged in the same way you judge others! When you judge, often you will attracted judgmental people. From time to time, bird of same flock fly together. People of judgmental gathered together to judge one another – which lead to mediocre life. 1)Hypocritical – well its true. Some of us really do act virtuos and morally pure and there are those that don’t practice what they preached. But there’s also a wrong perception that because we’re christians we’re supposed to be perfect.However, transformation from being us to being like Christ is a lifetime process. 2)Some Christians are like that. They forget that their mission is not to save but to bear witness, to spread the word of God, . Only God can save. 3)Again, some Christians are really vocal about their disgust of homosexuality. Which is wrong. They are humans too. They need to feel God’s love as much as we do. Only when they accepted God could their lives start to change. 4)We have a different reality because of God. I much prefer than theirs which is full of uncertainty and stress which sometimes lead to depression. God’s answer to life’s problem is always simple. It is man that wants to make it difficult. 5)That’s a problem. They should follow Jesus lead and leave politics to the politicians. Christians should only do what the Lord commanded us, to love. 6)Some christians do tend to be critical. But we have no right to judge for we ourselves are sinners. I just felt that we christians spend too much time persecute sinners, which also means including ourselves. Really contradict, :)! I might have everything or nothing but I know that what I have from the people I love to the ones I cannot but hate the ability to see God’s love in it’s creation I know we can’t vanquish our fear or sins but I know that with God’s help we can Change from the inside that one day we know why the act we call it sin is wrong ! Why they are so fancy? Churches are meant to prayer ! I know but all the prestige and luxury of inslaving men are better to go for the king of the kings who’ll free us all ?